KARL Moore may never match Conor McGregor’s brash showmanship outside the octagon, but the Belfast fighter is just one win away from equalling his achievements inside. McGregor remains the only professional Mixed Martial Artist to hold two world titles at different weights simultaneously. This Saturday night, Moore bids to win the Cage Warriors heavyweight world championship belt from defending champion Mauro Cerilli at London’s Indigo at the O2 Arena. The fight will form part of Cage Warriors 92 Super Saturday event with three world title fights taking place across two events on one night. Sam Creasey and Nathan Greyson will fight for the vacant flyweight belt, while the second main card will be topped by a bantamweight title fight between defending champion, Nathaniel Wood and Luca Lovine. 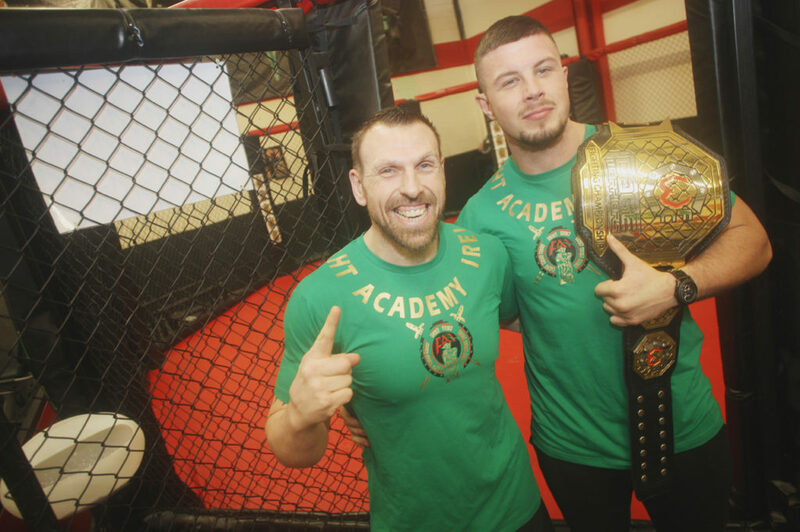 The Belfast man claimed the light-heavyweight belt at Cage Warriors 81 in Dublin’s 3 Arena last year and his coach, Liam Shannon believes that a call-up to the UFC will finally happen if Moore is successful this Saturday. “Karl is bidding to be a two-weight world champion and that has only been done once before – by Conor McGregor,” said Shannon. “It is the final step before the big show for Karl. Hopefully he gets the win at the weekend and the UFC come knocking. Shannon believes Moore will be a huge success in the UFC, but like all fighters he needs his big break. McGregor’s arrived back in 2013 when he was a late call up to a UFC show in Stockholm, Sweden. After securing a first round knockout win over Marcus Brimage, the Dubliner was awarded the ‘Knockout of the Night’ award and the rest, as they say, is history. “He (Moore) is ready for it,” insisted Shannon, who coaches from the Fight Academy Ireland gym in Poleglass. “Karl is very reserved – he is that laid back he is horizontal! “He is doing door work and other things to make ends meet at the minute. “One fight could change his whole life. “Conor’s big break came when he took a last-minute fight in Sweden. Moore may have already been called up to the UFC promotion had his bout with Cerilli gone ahead as planned last December.